If you can’t live without the CnWizards (like me), you can download the CnWizards 0.9.9.635 Unstable version which supports RAD Studio XE3 right now. Categories: Delphi, Delphi-News | Tags: Delphi | Permalink. 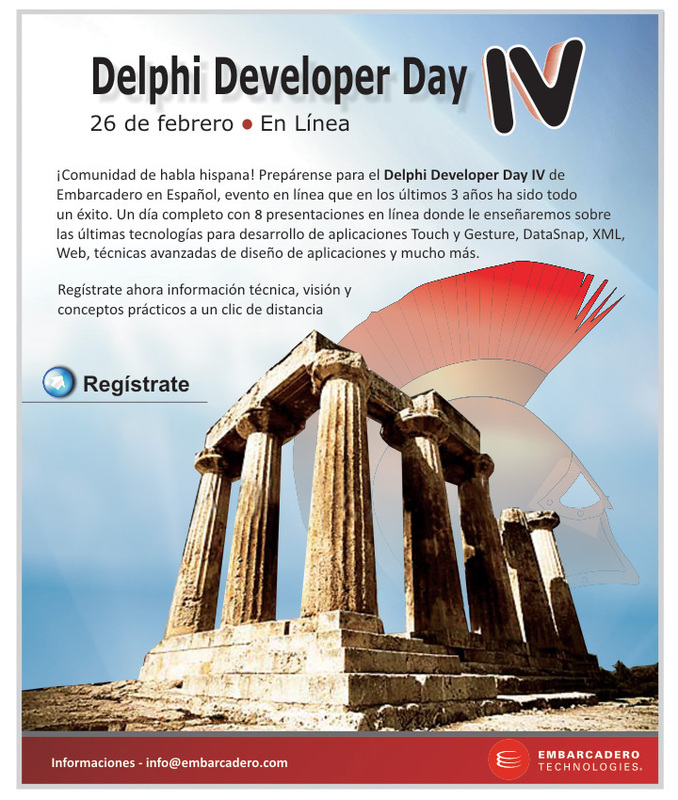 Friday 26 February, will hold the fourth edition of the Delphi developer day in Spanish. for more info and registration you can check this link. An Unofficial RAD Studio 2007 Debugger Fix for Windows 7 has been published. The primary problem being fixed is a debugger assert that usually occurs when terminating a process being debugged on a 64-bit version of Windows 7. This version also fixes a few minor problems when debugging on Windows 7. Hi, The Delphi and C++Builder 2010 Updates 4, 5 (Database Pack), and Boost Library are now available. Categories: Delphi, Delphi-News | Tags: Delphi, delphi 2010 update | Permalink. Embarcadero has released the Delphi 2010 Help Update 1. you can find more info here. Documentation has been completed for the StdConvs unit. Documentation has been completed for the GestureMgr unit, which was new in the RTM release. Documentation has been added for many of the DataSnap APIs. See the DSConnect, DSHTTP, DSProd, and DSServer units. New resurfaced intrinsic ROUTINES are documented. The documentation team has fixed approximately 25 bugs reported on customer forums and in direct customer feedback. The documentation team has fixed approximately 20 bugs reported in QC, RAID, or direct customer feedback. The View > History command is now documented. Categories: Delphi, Delphi-News | Tags: Delphi, delphi 2010 update, delphi help | Permalink.